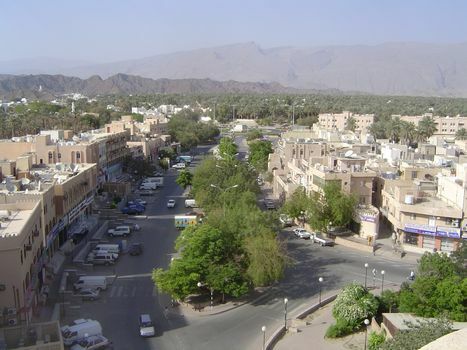 A gap in the Hajars carries highway traffic through the mountains and onto the plateau of Oman proper. 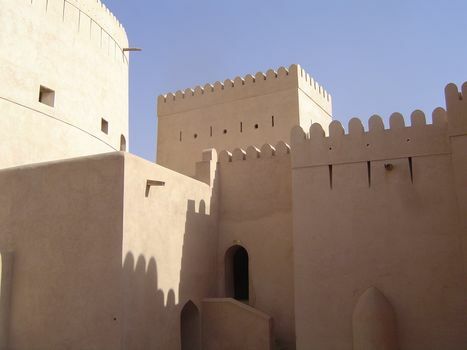 One of the two chief towns here is Nizwa, which, depending on your interests, is an oasis famous for dates, a center of Islamic studies, or the possessor of a massive and elegantly restored fort and palace. From the top of the fort, looking south over the oasis palms. 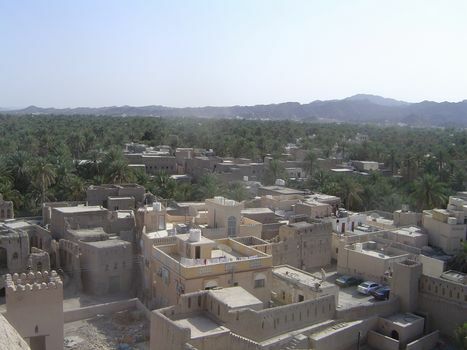 The palms are watered by two major falaj (plural aflaj), or irrigation systems. There are 4,000 of these systems in Oman--counting only the thirty percent that flow perennially. 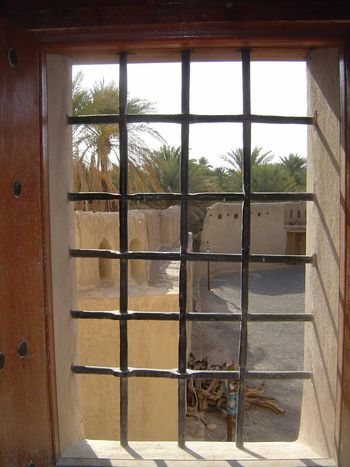 The most important one at Nizwa is the Falaj Daris, which runs for two miles underground before emerging at the surface to be divided among the date growers. Some 40 varieties of dates are grown here. Traditionally, farmers grew several varieties, some bearing as early as June, others as late as December. Nowadays, however, almost the only varieties being planted are the highly prized yellow khalas or red khunaizi. The fruit from a single khalas is worth over $300 a year. Growers sell their dates all at once and park the money in the bank. Looking north over the town center. There are banks on both sides of the street, and they're equipped with ATMs. The old market is pretty much a tourist trap. Nearby, however, there's a new (1992) but real market. 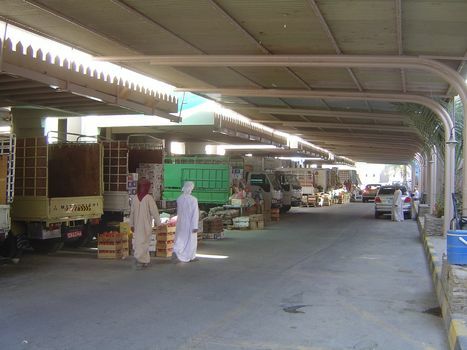 These are the delivery bays for fruit and vegetables. 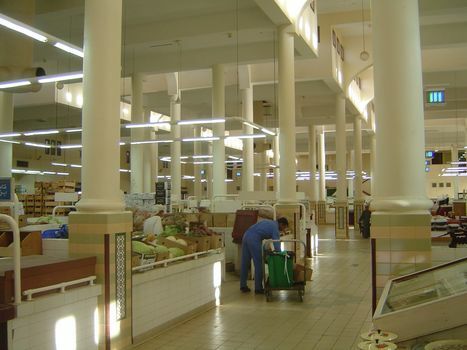 The same market in after-hours. Not what you expected? Well, that's Oman. 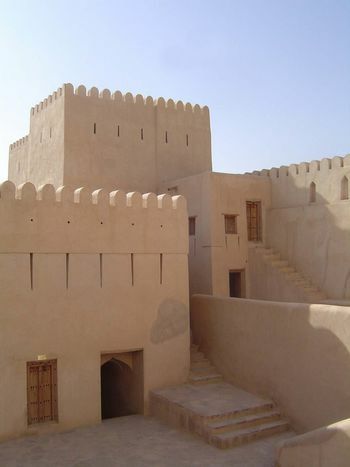 We've come to the central tower of the 17th century Husan al Aqor Fort, from which the panorama pictures were taken. Adjoining it is a palace. 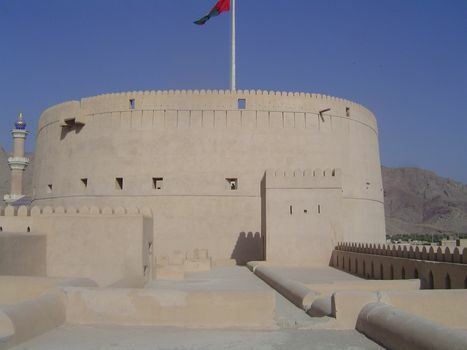 Unlike the Lalali and Mirani forts of Muscat, which were begun by the Portuguese, Nizwa Fort was an Omani production, built by Sultan bin Said bin Malik al Ya'arubi about 1650. 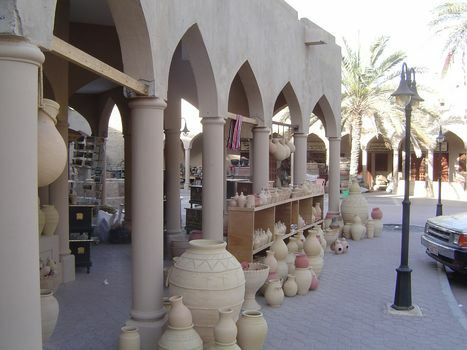 The handsome color comes from sarooj, a nearly forgotten Omani building material. Oasis soil is formed into bricks, which are stacked, covered in earth, baked for a week with palm logs for fuel, then crumbled into a powdery cement. Unlike portland cement, sarooj doesn't crack. 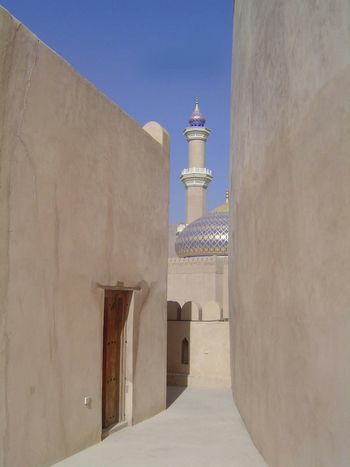 In the background is the Friday mosque--its dome reconstructed in 1529. 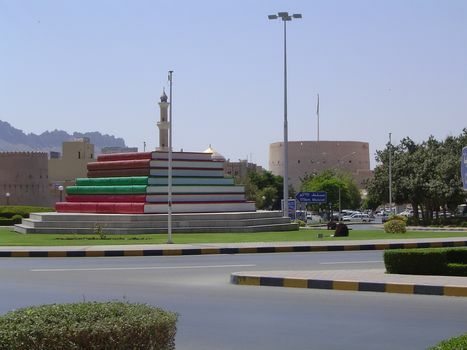 A reminder of Nizwa's reputation for Islamic scholarship. 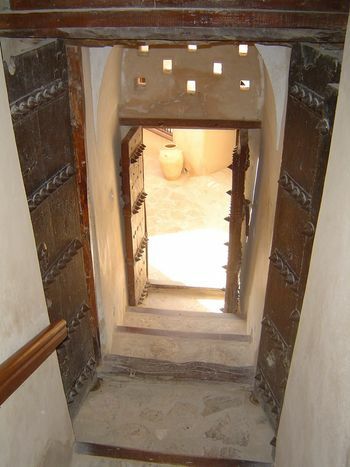 A staircase into the palace. 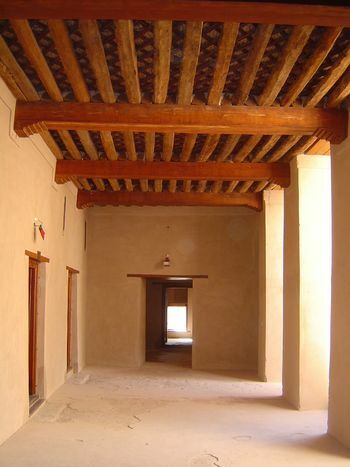 A palace portico, with palm-log joists. 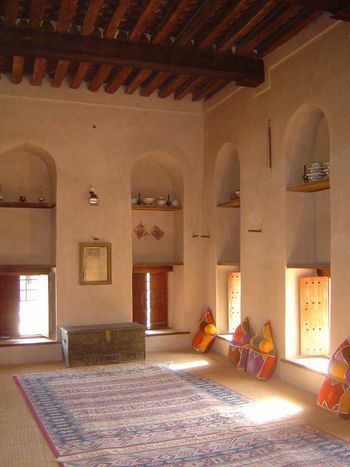 An interior room, with small windows to minimize the glare. 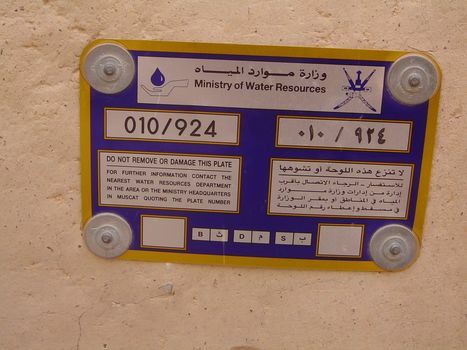 The fort has its own well, carefully labelled like others in Oman.